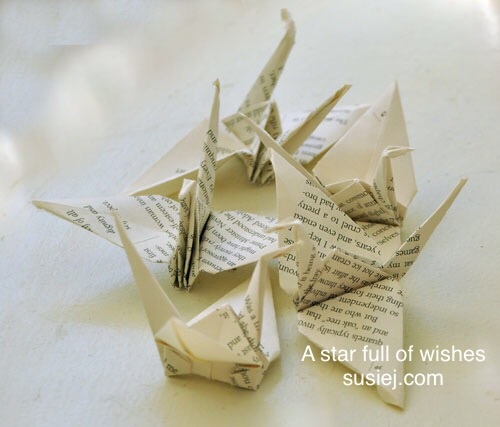 Each crane holds a wish. Would this be a nice way to ring in the New Year? 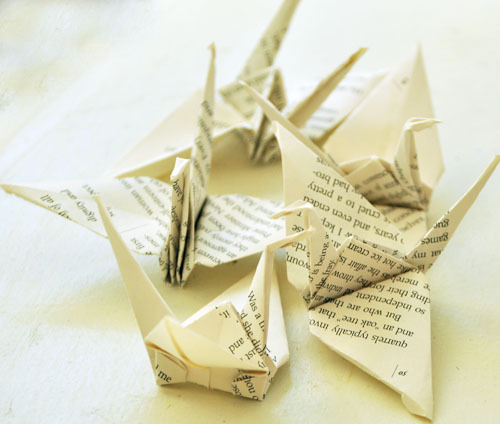 With each crane holding the words of a wish you’d like for the year? Or maybe for a wedding, and each guest writes a note to the couple, or to the new baby soon after the birth? Or for our new graduate before he goes out into the world? 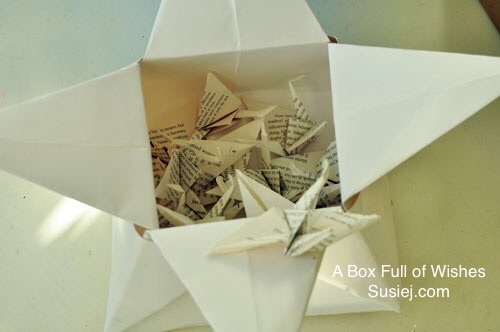 Here’s how to make the box: We used card stock for this one to make it sturdier, but paper will work too. 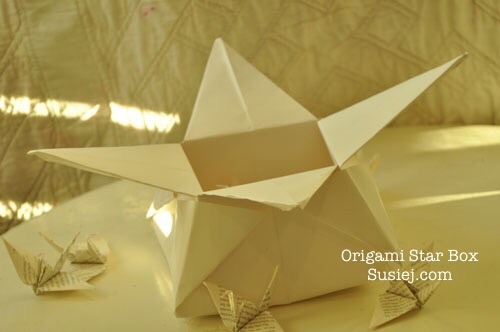 Step 1: Start with a square piece of origami paper, but if you only have regular 8.5×11 paper, follow these instructions to make a square sheet. Step 2: Fold in half by folding the top corner to the bottom corner. Step 3: Fold the left corner to the right corner. Step 4: Open the top layer so you can squash fold the right corner to the bottom corner as shown in the pictures. Step 5: Turn the paper over. Step 6: Lift the left flap up vertically, then open and squash down like other side. Step 7: Rotate the figure so it’s upside down. 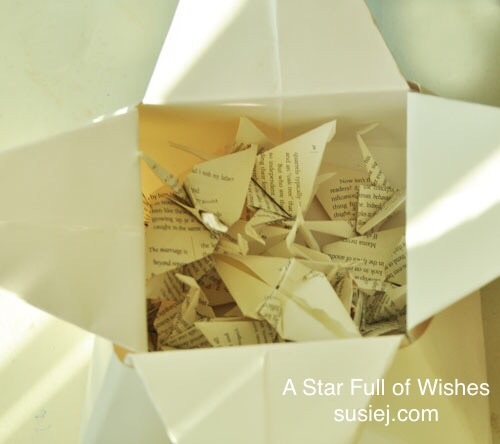 Step 8: Start with a square piece of origami paper, but if you only have regular 8.5×11 paper, follow these instructions to make a square sheet. Step 9: Fold in half by folding the top corner to the bottom corner. Step 10: Fold the left corner to the right corner. Step 11: Open the top layer so you can squash fold the right corner to the bottom corner as shown in the pictures. Step 12: Turn the paper over. Step 13: Lift the left flap up vertically, then open and squash down like other side. Step 14: Rotate the figure so it’s upside down. Step 15: Rotate the figure so it’s upside down. Step 16: Fold the left flap over to the right. Step 17: Fold in both flaps at the crease. Step 19: Like Step 17, fold in both flaps at the crease to achieve what’s in this picture. 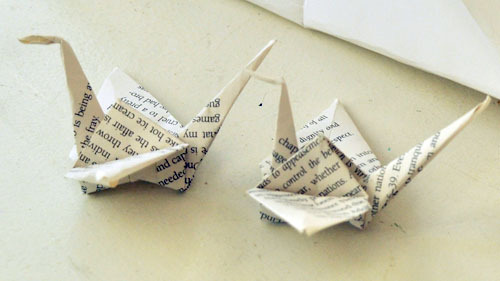 Step 20: Fold the left flap back to the right so it’s even with two flaps on each side. Step 21: Fold the bottom up at the corners to create a triangle, then unfold. 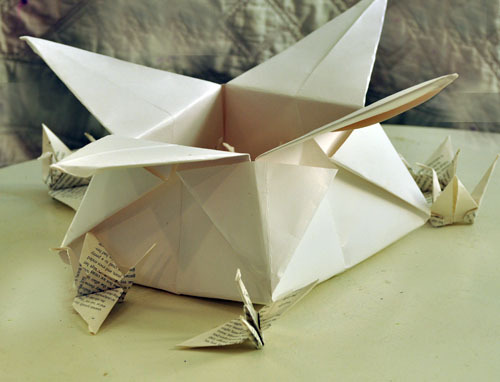 Step 23: Fold the left flap to the right so you can also fold that triangle down. Step 24: Fold the other two triangles down. Step 25: Carefully open the figure from the top and straighten out all sides so they’re straight. The bottom should flatten out.